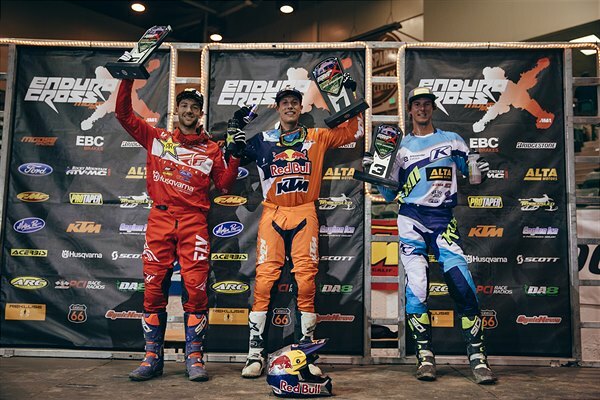 Rockstar Energy Husqvarna Factory Racing Off Road’s Colton Haaker fought his way to a podium finish at the Reno EnduroCross, the third round of the EnduroCross Series, held at the Reno-Sparks Livestock Events Center in Reno, Nev. on Saturday. Haaker was on the move in his heat race and hoped to take the win, but he unfortunately forgot to take the dreaded No Joke Lane and, as a result, did not receive a direct transfer to the Main. He was forced to line up for the LCQ, where he put on a charge and earned his spot in the Super EnduroCross Main Event. He had a second-row start in the Main, but worked as hard as he could to navigate through the pack and earn a second-place finish. He is now tied for the lead in Super EnduroCross rider point standings.